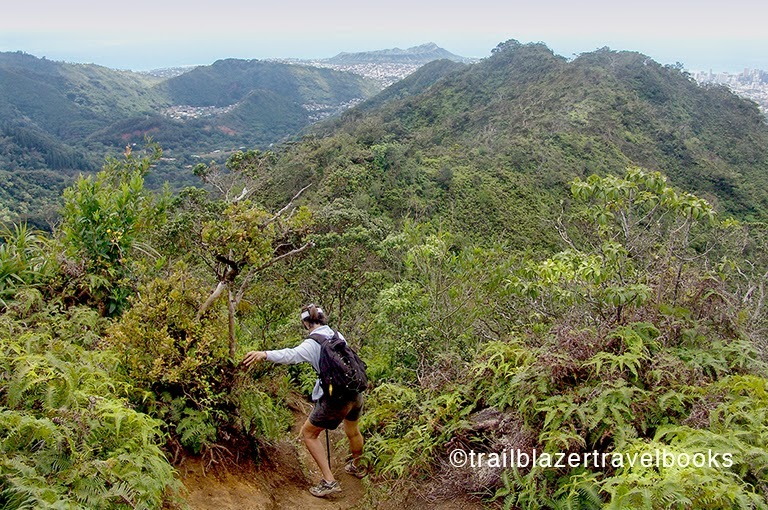 As is the the case for many hikes into Oahu's razorback Ko'olau Mountains, the trailhead begins at the end of neighborhood streets only a few miles from Waikiki—in this case at the Wa'ahila Ridge Recreation Area. Suburbia becomes wildlands after only a few steps. After a few thousand steps (three-plus miles and 1,900 feet in elevation) you achieve the narrow crest of the range, with a straight-down look at the Windward Coast. The Mount Olympus trail rends skyward in ramps and benches, narrowing to two feet in some places, where snarls of greenery disguise vertical dropoffs. But it is not as dangerous as other trails on Oahu. Take care with foot placement and bring along a hiking pole, and you'll be fine. Several view knobs on the way up are worthy destinations for shorter hikes, and families can take an even shorter stroll in the recreation area, through ironwood trees and Norfolk pines to picnic tables with views of Honolulu. 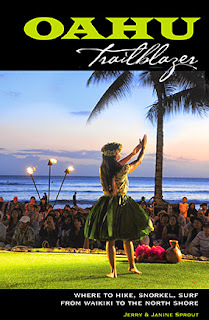 Oahu Trailblazer has more details for this trek, as well as others that are a short drive from the high rise beach resorts.